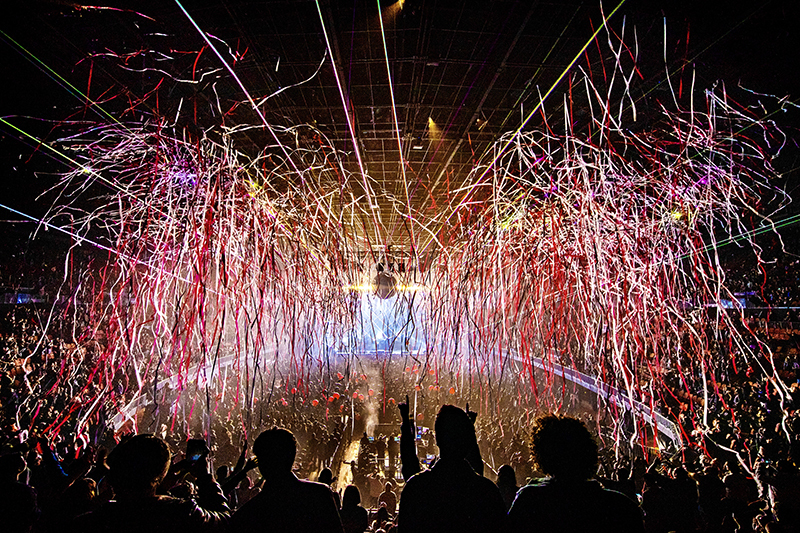 ER Productions Wows Crowd for New Year’s Eve Show at the Forum in L.A. In 2016, Black Sabbath embarked on their final tour, dubbed “The End.” The last show took place Feb. 4, 2017 at Genting Arena in the band’s home city of Birmingham, England, with founding members Ozzy Osbourne, Tony Iommi and Geezer Butler on stage. But that didn’t mean Ozzy was stopping, by any means. In fact, he’s been out on the road supporting his No More Tours II tour since last summer. His previous No More Tours adventure was in 1992, so it seemed like the time was ripe to explore this end of touring angle again. Ozzy’s shows have never been big on pyro over the years. Propane flames have long been avoided on his tours. Any flames on an Ozzy show were achieved with video. 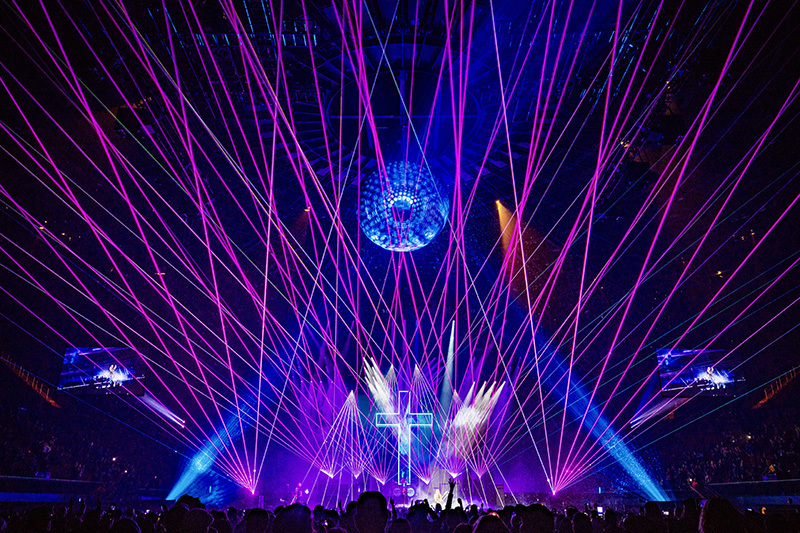 But his show on last New Year’s Eve featured a full range of special effect products from international Laser and SFX provider, ER Productions. By special effects, I’m talking about everything from flaming comets to cryo, smoke effects to lasers. They were even called on for the all-important balloon drop. As the story goes, Sharon Osbourne wanted her husband’s production to do something special for the home town crowd on this momentous evening. 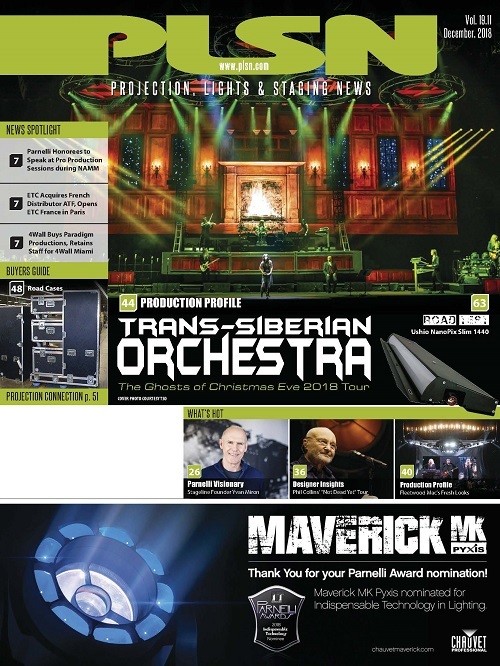 Enter Terry Cook, the lighting designer / Show designer from Woodroffe Bassett Design who, alongside Andy “O” Omilianowski, looks after this artist’s production needs. Terry opted to add special effects, as the only effects the tour was consistently using were lasers and lots of smoke. 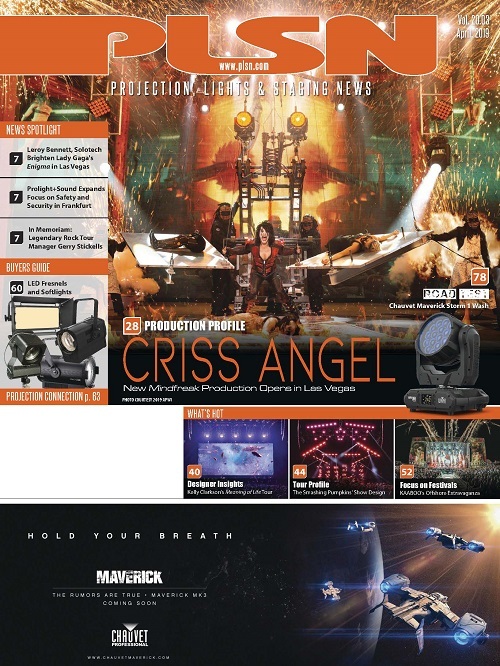 Since WBD has already been utilizing equipment from ER Productions for the touring laser systems, it only made sense that they rely on that vendor to supply the special effects goods. Terry approached Ryan Hagan (co-founder of ER Productions) who, with SFX project manager George Baker, helped Cook develop the design along with choreographing the placement of the cues in the show. Video elements are instrumental to the set and overall production design. 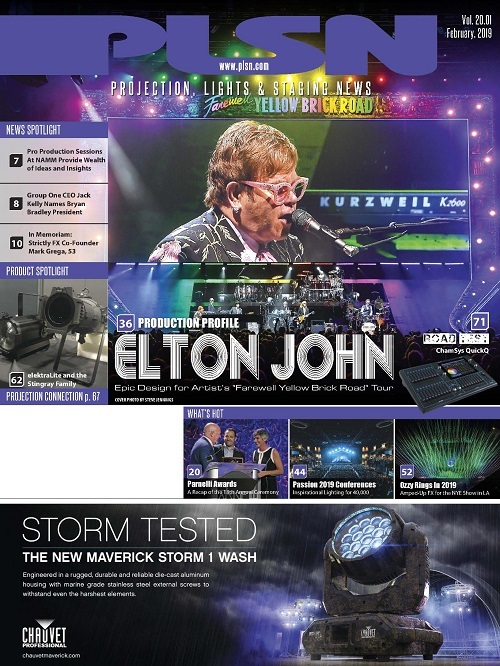 The media content includes the use of snow as well as flames during the performance, yet none of those physical elements appear on stage. That was one of the things brought up in conversation. Upon meeting together, the group wondered the best way to fill an arena with faux snow as opposed to bubbles and/or suds that come down out of dedicated snow machines of past. That’s what led to the idea to incorporate Typhoons into the show. 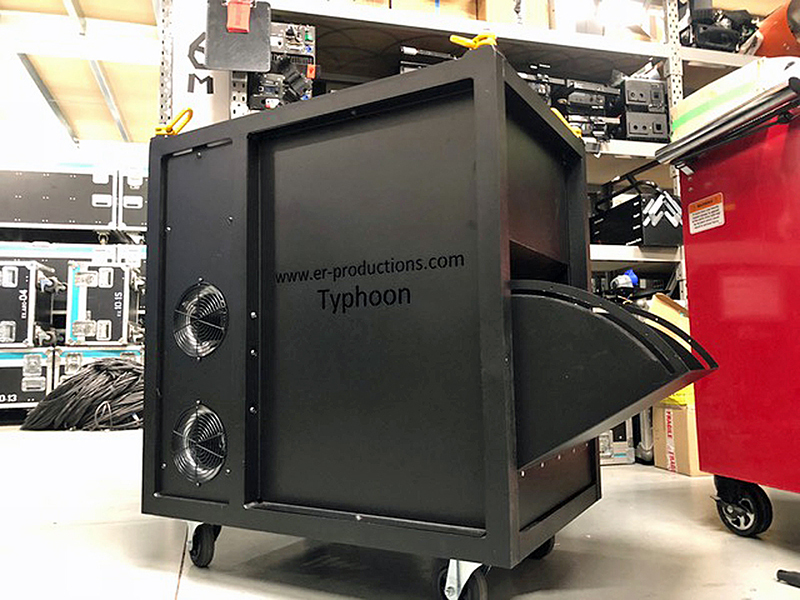 The Typhoon is ER’s first non CO2 confetti machine. A new product launched just for this show, they work via a set of powerful silent fans that push the confetti through a specially designed tunnel that has a self-hopper, continuously feeding the confetti product into the machine. The typhoon can deliver confetti of all sizes through it. “Terry wanted a big coverage of snow over as much of the audience as possible — that’s why we went for Snow FX confetti,” says Baker. “Snow Confetti is 10 x 10 mm snowfall paper confetti. It’s much smaller in size from normal confetti. While this machine can work with any sized confetti, this was the appropriate call.” The machines run silently and there is no CO2 necessary. An audience truss structure was needed to support all the FX devices that Cook had spec’d for the show. This involved three spans of 56’ truss. These were in a U shape. There were two — 8 x 8 floating Cryo Platforms that held 24 CO2 tanks above the audience, as well as control system for the Typhoons and Psycho2 Jets. With the power and throw ability of the Typhoons, the fixtures themselves are not small. Rather than try and mount them to a truss, they were easily underhung with the use of four shackles mounted in the corners of the fixture. The Typhoons effectively pushed out over 200 kg of product. Also suspended over the audience were 24 Magic FX Psyco2 jets. These pointed blasts of cryo effects straight down a good 15 feet. There is a panning mechanism in the nozzle that allows the shooter to wave the CO2 blasts back and forth. The units were spread out pointing both ways to give even coverage over the entire audience area. The Pysco2 jets ran on SR and SL trusses all the way down their length. They were fed CO2 from the platform tanks and triggered with DMX. The effects were triggered from a Road Hog 4 console, with George Baker assuming the role of pyro shooter for all effects. The cryo was part of the midnight sequence welcoming in the New Year. Speaking of that Sabbath tune, most New Year’s balloon drops happen right as the clock hits zero on the countdown. But Ozzy is far from predictable. 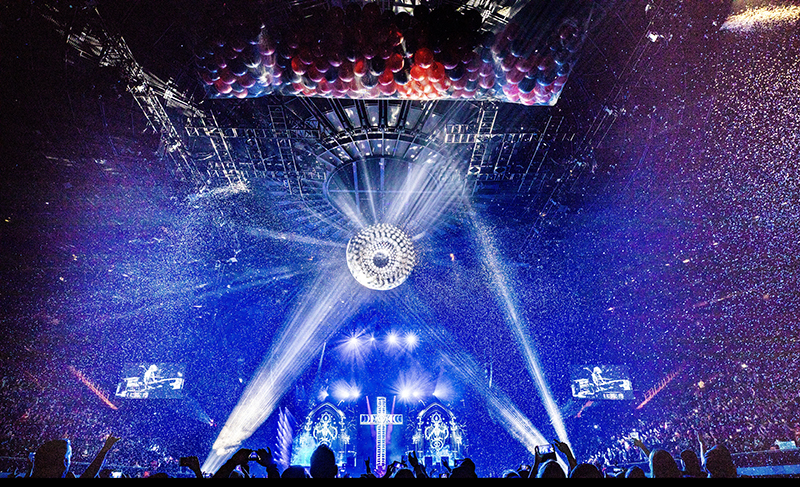 While the production insisted on a balloon drop, the timing of it happened during Paranoid as well. ER Productions provided an Electro Kabuki system that included 20 EK2 solenoids and a single EK controller. 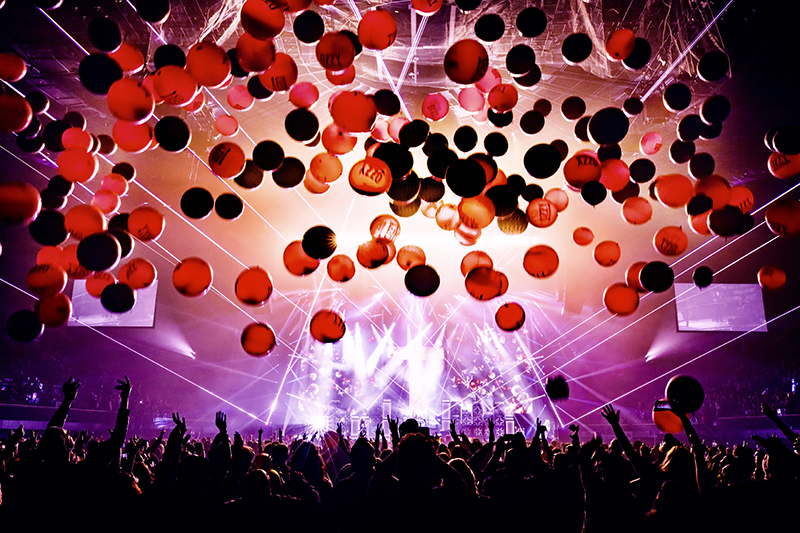 Netting was stretched between the two parallel audience trusses to hold the 500 custom printed red and black balloons. The solenoids tripped flawlessly, releasing half of the net as the balloons cascaded down from above. There were 12 stations where pyro was shot from, six on the ground and six in the air. Additional pyrotechnics were set off during the midnight sequence including Red MultiShot tracer comets that ran 20 feet into the air and were shot up over the backline. Bright white mines with a 20-foot tail as well as Gold Flitter mines were also engaged. Many of the effects were triggered from the Road Hog 4 — getting DMX signal to many of the devices would have meant networking a large amount of cables. ER relies on 30 Galaxis firing units to spread the signal everywhere from the stage to the trusses to the perimeter of the floor. These wireless devices receive the signal from the Hog 4 console and output DMX to all the devices that require it to fire. These Galaxis units ran on two separate frequencies, one for pyrotechnics and the other for the Stadium Blasters and Stadium Shots. Low-lying fog machines generating thick plumes of smoke that stayed low on the stage were utilized during the playing of “Mr. Crowley” as well as “Mama.” This required the use of four of Look Solutions Cryo Fog HP/XL units. These fixtures mix liquid CO2 with the fog fluid in the machine to keep the smoke chilled and close to the ground. 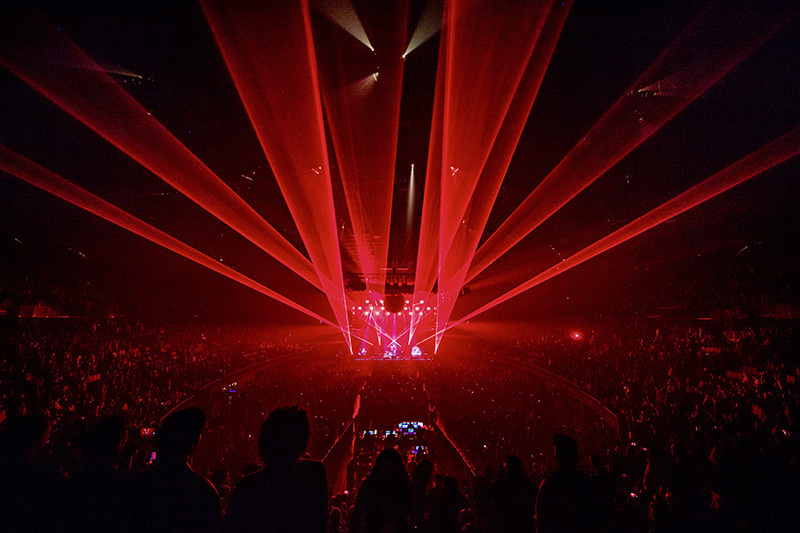 Many companies start out as special effects vendors, and along the way, they incorporate a few lasers into their inventory, as just another function of the company. 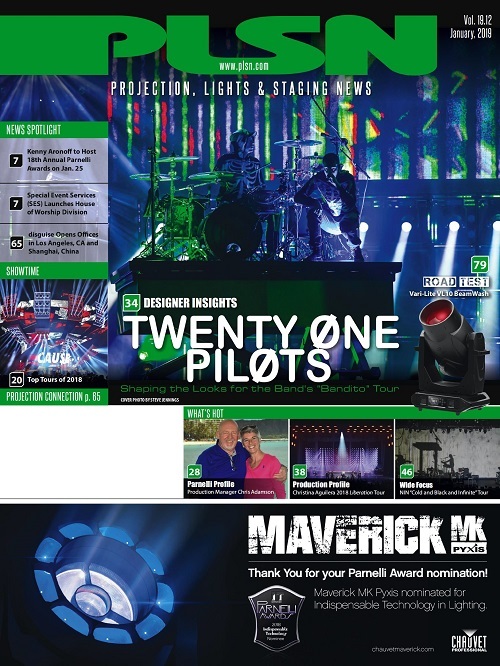 ER Productions is a well-known award-winning laser show and laser system design specialist. They even have a line of their own proprietary lasers they sell. 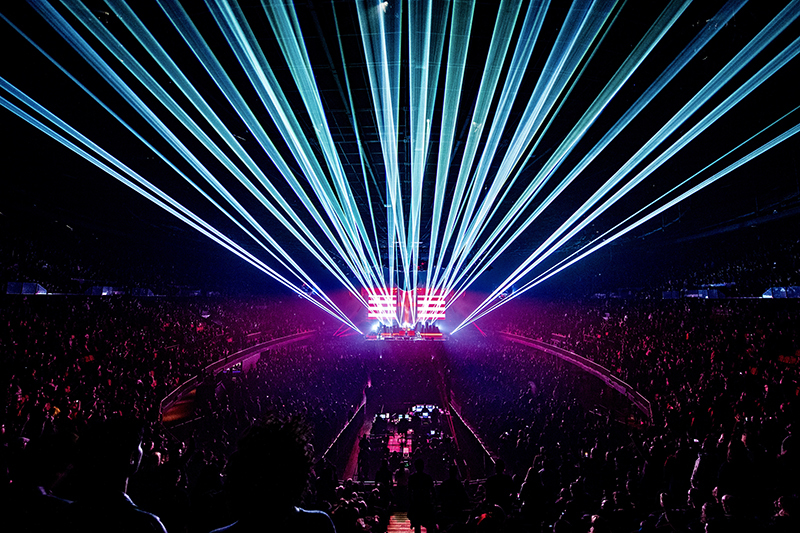 For this show, ER provided 12 LaserAnimation Phaenon Pro30000 units. These pack a punch with 31,600 watts of power, and utilize all of its power in each of its diodes, meaning each color is equally as strong. 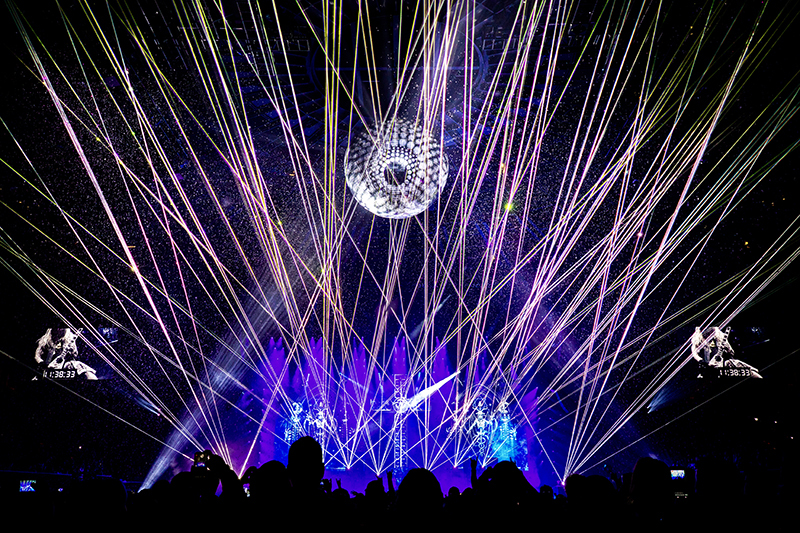 When all are mixed together, the laser emits a beautiful true white beam. 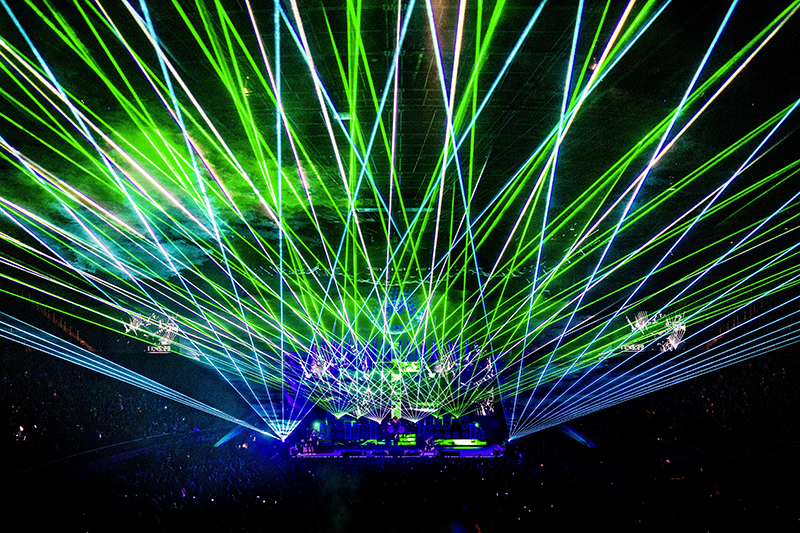 All the lasers were programmed using Beyond software. These units are not fitted with Pangolin FB4 software, so ER provided outboard Pangolin FB4 racks that could take the DMX signal from the HedgeHog 4 controller and run the cues. The touring system utilized eight Look Solutions Viper deLuxe Fog generators and four of the company’s Unique Hazers as well. The tour is set to run through this coming summer. 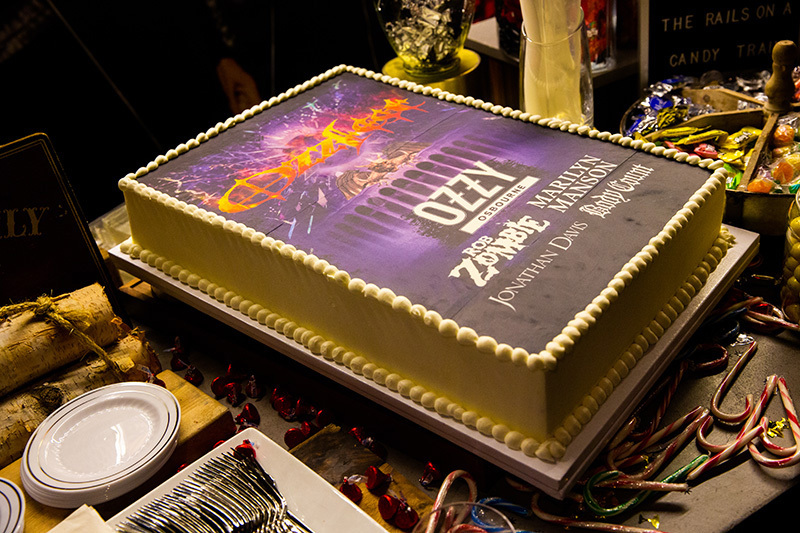 Whether there will be any more tours after No More Tours II is anyone’s guess — including Ozzy’s. 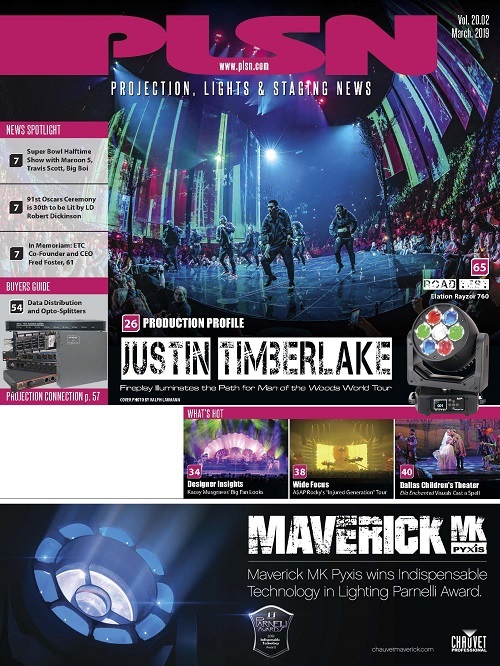 Special FX – the icing on the cake.